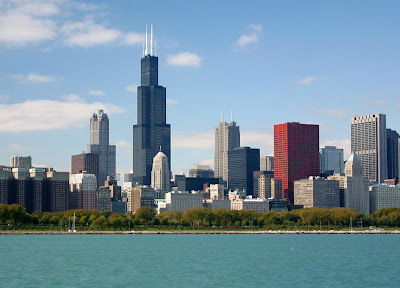 "My Kind of Town, Chicago!" Thanksgiving & Round Up! Every year, we take time out to give thanks for the many blessings we have. For us, one thing we are very thankful for is our group of friends who share the same food passion as we do. As a result, we hosted our annual Thanksgiving party with friends we've made from our group, What's Cookin Chicago. Rather than feasting on classic Thanksgiving fare, we graced our table with Chicago inspired dishes and friends brought dishes that were enjoyed in previous events we've hosted. Spicy Living joins us to share some specialities of India - Appam & Thenkuzhal. I loved this entry because I learned about new ingredients, cuisines and dishes! Check out Spicy Living's blog for recipes and information on specific Indian dishes! What food comes to mind when you think of Boston? 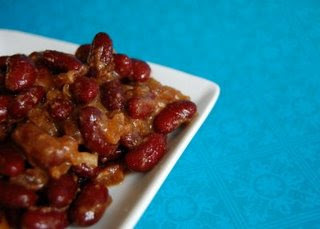 For me, it's Boston Baked Beans and Jen shares with us her recipe. Even better is that this recipe is made in a crockpot! Check out Jen's blog and give these a try, even if it's an excuse to use your crockpot! I recently met Courtney and what a sweetheart! I learned about her Alabama roots and her many travels before she settled in Florida. As a native of Alabama, Courtney shares a recipe of Fried Pickles. Fried Pickles is common in the south and most folks may be familiar with it being prepared with pickle chips. 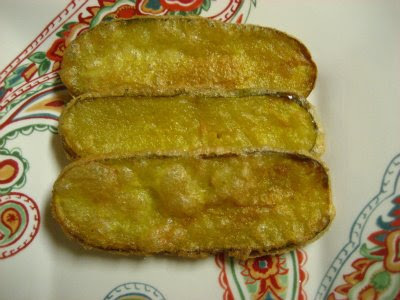 Courtney's entry is made with pickle slices and is one of her faves at a local Alabama restaurant. Check out her blog for the recipe and get a taste of the south! 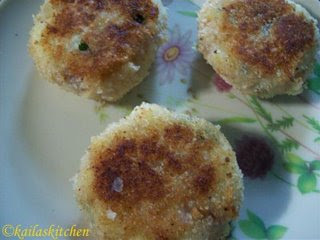 In Jayasree's corner of the world, tapioca is a staple ingredient and as a result, she shares a recipe for Kappa (Tapioca) Cutlets. This is a great recipe to try tapioca that isn't from a box! 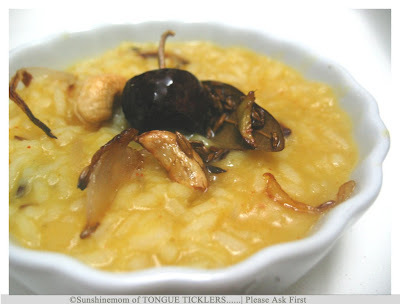 Check out Jayasree's blog for the recipe and how she got her hands on a real tapioca plant! Although currently living under the Florida sun, Karen is from Michigan and celebrates her roots with her entry. 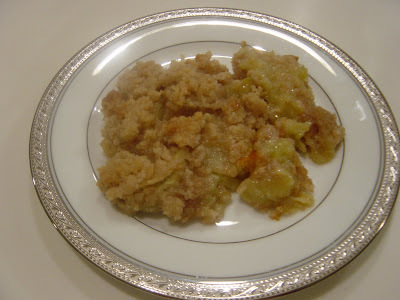 She shares with us her mom's Apple Betty recipe made with Michigan apples. Michigan is well known for the wonderful apples they produce in the state and Karen loves to prepare them in various ways. Check out her blog for the recipe and give this a try with the many apples available this season! No one likes getting sick... but I'll admit being sick may be worth it just to give Harini's Dal Khichdi recipe. Harini shares with us this comforting dish that's common in India to give to babies as an early food or to coax a cold. Perfect for the fall weather, this is a great recipe to try. Check out Harini's recipe and make this on a cool fall night to warm up to! Shayne of One Bite At a Time! Who doesn't like fries... even as a little indulgence now and then? 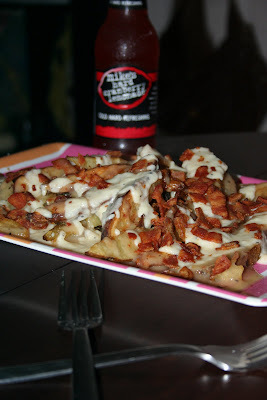 Well Shayne has shared her recipe for Dirty Jersey Disco Fries and boy, talk about indulgence! This happens to be a popular way to serve & enjoy fries in diners of New Jersey & New York. Oven roasted fries, topped with a bechamel sauce and gravy, then garnished with crisp bacon - YUM! Check out Shayne's blog for a great step by step recipe and get dirty with these disco fries! One of the first foods that comes to when I think of New York is cheesecake! Cathy represents New York wonderfully with her recipe for New York Style Cheesecake. I've had New York Style Cheesecake on a previous trip to NYC and I'm anxious to try Cathy's recipe. You should too so check out her blog for the recipe! wow what a spread! you always amaze with all your wonderful foodie events! wow! that was A LOT of food...looks like so much fun! Looks like so much fun! What a great selection-and what a great idea to make things from your hometown! All of the food at your event looks so delicious and comforting! Yum, Thanksgiving is the best! Wow love tha array of dood? Just superb. Looks like all of you had fun.